The last time I posted I showed you guys what we saw the first time we came to look at the house. I still remember the day we walked into this house. It had been a long evening of looking at new places to live. I think we saw about 5 that evening. Each house we went to was more and more discouraging than the last. The kids and Jimmy’s parents were with us. We kind of wanted to throw in the towel, but luckily we didn’t. When we got to this house we were so pleased by the amount of space, the location, and the possibilities it had to offer. Everyone agreed this was our future home. As you already know the kitchen was the biggest project we had to under take in this new house before moving in. The next were the floors. 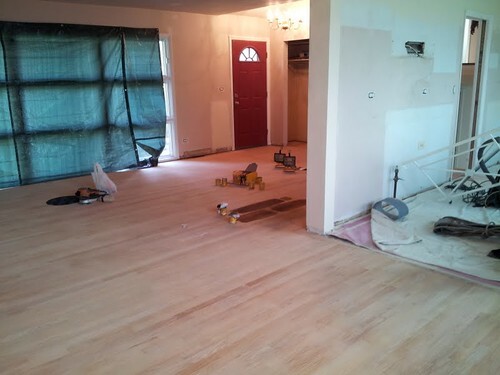 When we first came to see the house Jimmy checked under the carpet and to our surprise there were hardwood floors. I knew from the beginning that I wanted really dark floors. Jimmy felt the same way I did, so it was official the floors would be stained a dark color. 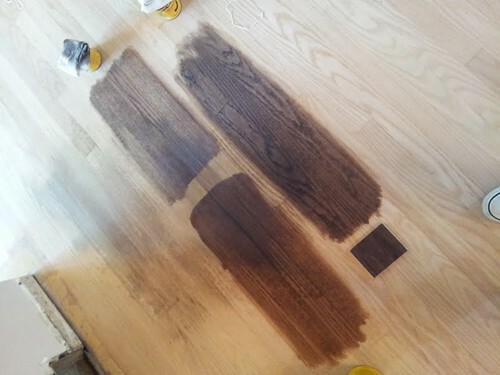 Now it was time to find someone who could sand and stain our floors. This was too big of a project to take on ourselves. We pulled up all the carpet and the tile in the entry way the day of our closing. 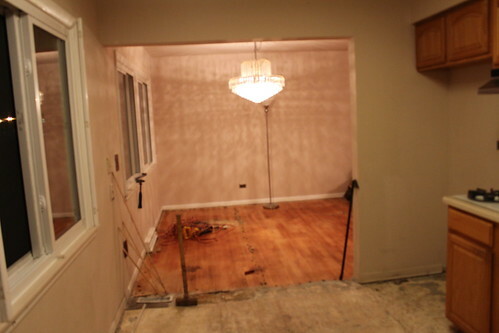 Here is a picture of how the floors looked once we pulled up the carpet. 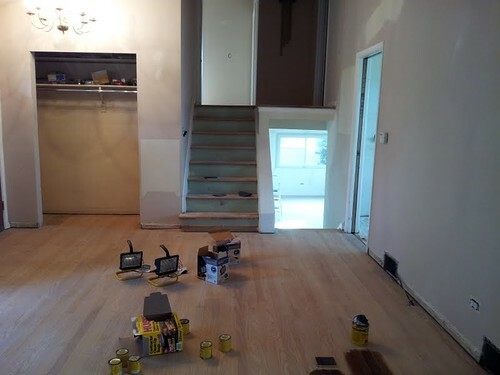 We also had to pull off all the trim and remove the banister. Yes we put our children to work. You have to teach them at a young age what hard work really is, so that they can appreciate it when they get older. 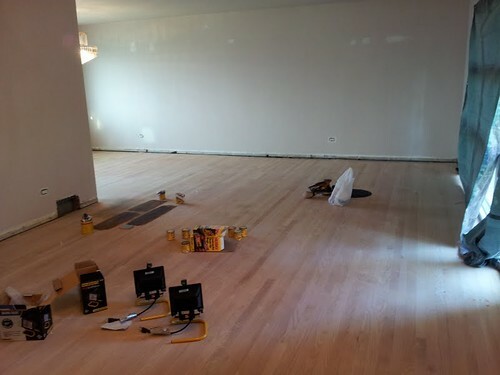 The guy that we hired to do the sanding warned Jimmy about picking a really dark color. 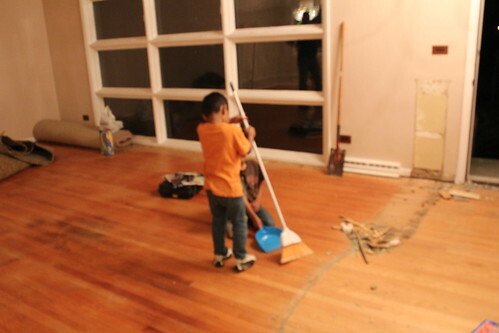 He said we would see all the dust on the floor. So he started to worry about getting the floor stained really dark. Of course I started to get irritated with the fact that Jimmy wanted to go lighter. Of course now we had to come to a compromise. 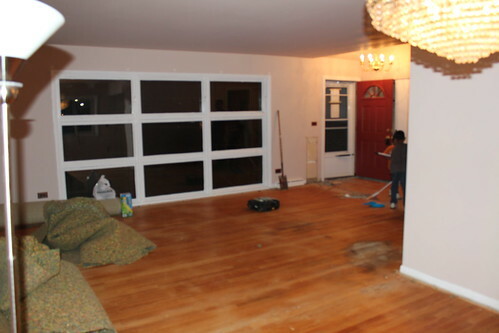 When we removed the carpet, we noticed a few really dark stains on the floor. We were hoping that after they sanded the floors the stains would disappear. Unfortunately that wasn’t the case. Or should I say fortunately cause it mean that we would have to go darker?? 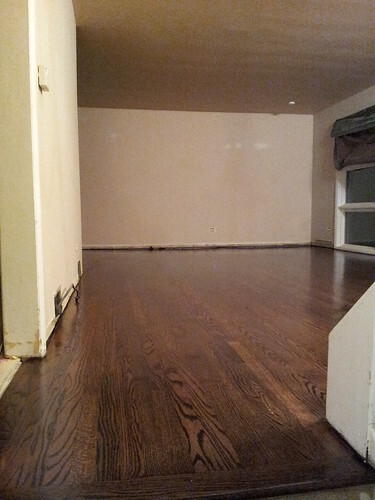 Here are a few pictures of the floors after it was sanded. Here is the picture of the 3 color choices we had to choose from. Of course we picked the darkest because you can’t see the stain with that color. I had actually wanted to go darker, but I’m really happy that we didn’t go that dark. 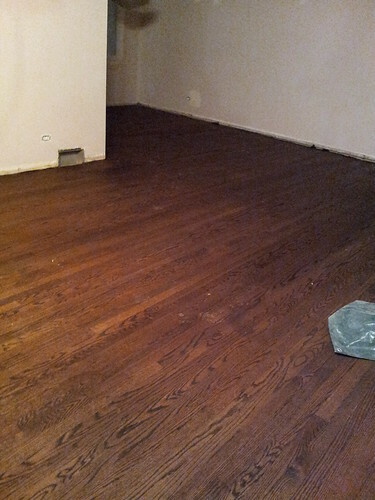 Here is what the floors look like after it was stained. Couldn’t get a better shot cause we weren’t allowed to walk on the floor. Not to mention you could smell the stain without opening the front door. Once we opened the front door the tears just started to flow because of the smell. I will leave you with this last picture. 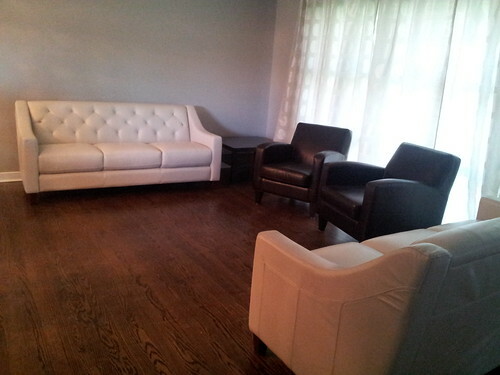 Here is what of our living room looks like with our furniture sort of put into place. 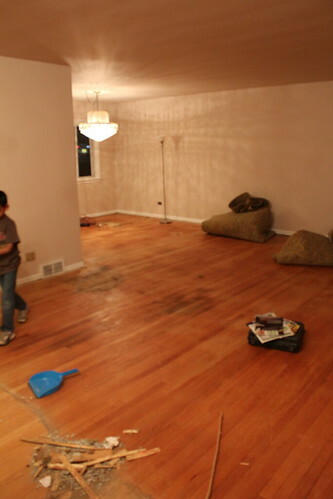 Stayed tuned for more updates on how our living room has evolved since we took this picture sometime in April. Sorry for the long post. I hope you enjoyed. Let us know what you think.